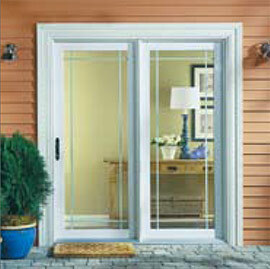 Let us help you make your patio door become a clean, simple and elegant entryway. No matter the type of patio door you need for your project, we have various types, models and materials available to choose from, including those that Energy Star efficient. 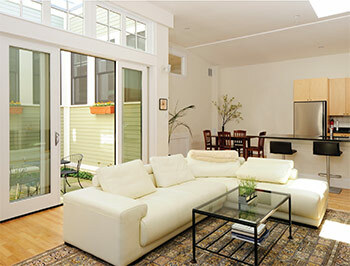 The superior craftsmanship and construction of patio door installations from us at Mt. Pleasant Window & Remodeling add beauty and elegance to any home and patio space. All of our products are built for years of quality performance and enjoyment, for every season. We offer several models of reliable and aesthetically pleasing patio doors of both the popular Kensington and Pro Via brands. This high-performance door system is designed for optimum performance and beauty, as well as long-lasting, weather resistance. If you are seeking both beauty and brawn, look no further than our Quantum 2 model. The dependable, multi-paned door system of the 3000 Swing is able to come as a Single (Garden) or Double (French) Door. This model also has customizable color options to select from for creating an even more unique space that is also durable. With a full length fixed gear hinge to prevent panel sagging, a multi-point locking system that anchors the door in multiple points along the door length, and with flush bolts installed at the top and bottom of all French hinged units, the 3000 Swing Patio Door System is a fantastic, customizable option. The 5000 Sliding Patio Door System is exclusively made to be for maintenance free, with the finest of quality craftsmanship for full enjoyment. Every sliding door model is engineered with twin tandem bottom mounted rollers on a state of the art monorail system. A fusion welded panel creates strong unitized components to prevent air and water infiltration, and a 15 degree sloped sill efficiently diverts water away from the home. 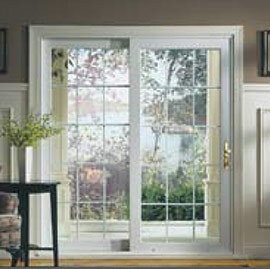 The 7/8” insulated tempered glass system assists in giving the door superior insulation and sound dampening properties. All of this combined allows for the smoothest of openings, and secure closures. Another available patio door system is within 2 or 3 lite units and is constructed of the same solid quality as our other dependable entry doors. For instance, our Sahara heavy-duty extruded sill has a 1 ½” wide thermal barrier oak-like riser that will not rot or warp, and is non-conductive. 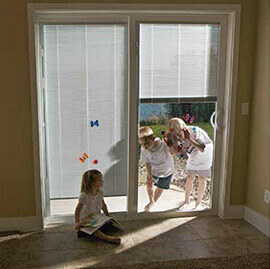 Retractable screen options are also available with these patio door systems. Whether you want a stunningly realistic wood appearance or a durable and energy efficient door system, our Pro Via Door products have the best hinged patio door for you. View samples of our patio door work in our virtual gallery! Interested in learning more about the options for patio doors that Mt. Pleasant Window and Remodeling carries? 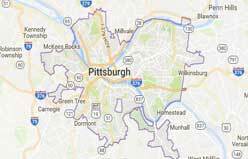 Complete our contact form or call us at 724-264-3252 to discuss our patio door options and learn which style and look will be best for your home and family.